TORONTO – This afternoon, hours before his fifth NHL game, Buffalo Sabres rookie Evan Rodrigues couldn’t stop smiling. “He’s always all smiles,” Sabres coach Dan Bylsma said inside the Air Canada Centre. True, Rodrigues, 23, always seems to be grinning. But tonight’s tilt, which will be broadcast across Canada on “Hockey Night in Canada,” is extra special for Rodrigues, who grew up a Maple Leafs fan in Etobicoke, about 20 minutes from Toronto. 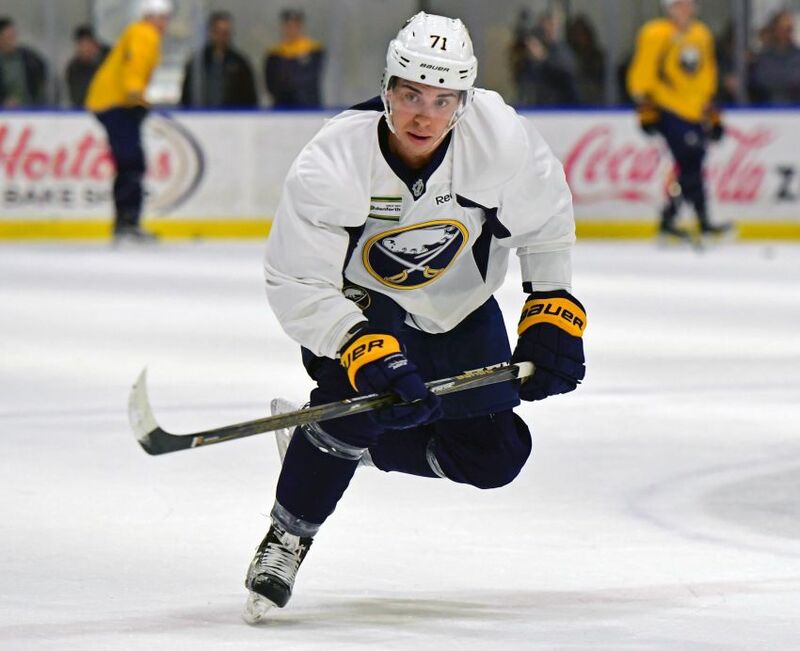 The Sabres recalled Rodrigues from the Rochester Americans this morning. Rodrigues was summoned on an emergency basis Thursday but sat out a 5-2 loss to Anaheim because winger Evander Kane was healthy enough to play. Rodrigues’ presence – winger Nick Deslauriers will be scratched – gives them a speedy center, something they will need against the potent Leafs tonight. Bylsma joked Rodrigues should wear No. 22 instead of 71 tonight because he will be occupying Johan Larsson’s spot between Marcus Foligno and Brian Gionta. Larsson is out for the season with a dislocated elbow and wrist. Check back later for more on Rodrigues. In other news, a bone bruise will sideline Sabres defenseman Cody Franson two to three weeks, Bylsma said. Franson blocked a shot Thursday and had a walking boot on his left foot Friday. Defenseman Taylor Fedun will replace Franson tonight and skate beside Justin Falk, his partner in Rochester earlier this season. Bailey, who has shuttled between scoring lines and checking lines throughout his 13 NHL games this season, earned his spot on a top trio, Bylsma said. In other lineup news, Sabres goalie Robin Lehner, who was pulled from a 4-3 loss here Jan. 17, will start tonight. Bylsma said Deslauriers is “probably a little bit worse for wear” after Thursday’s marathon fight with heavyweight Jared Boll. Tonight’s game is critical for the Sabres, who trail the third-place Leafs by seven points for the Atlantic Division’s final playoff spot. “Real simple, barring a 60-plus minute game, we’re going to be five points behind the Leafs or nine points (behind) after the game,” Bylsma said. – The home team has won 23 of last 27 meetings between the teams. – The Sabres begin their 10th of an NHL-high 19 sets of back-to-back games tonight. They’re 4-3-2 in the first game and 4-4-1 in the second. They host Vancouver on Sunday. – Lehner has some awful numbers – 1-2 with a 3.49 goals-against average and a wretched .880 save percentage – in four career games against the Leafs. – Leafs goalie Frederik Andersen will start, his 45th appearance this season.